Some would not call this a "risk off" trade because the bond I bought is rated B-. I have dabbled in Cinemark bonds before and you will see the 2023 Cinemark bond already in the bond portfolio is doing well. Look at the underlying stock Cinemark. 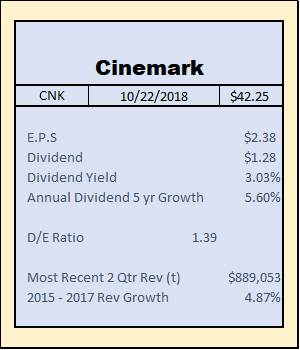 Applying my Dividend Machine criteria makes Cinemark, symbol CNK, look good. The dividend is around 3% but the bonds are paying closer to 5%. I bought the December 15, 2022 5.125% coupon for $96.10 ytm (yield to maturity) 5.437%. The cusip for this bond is: 172441AX5. This bond is just another feather in the quiver not where I will put all my investments.